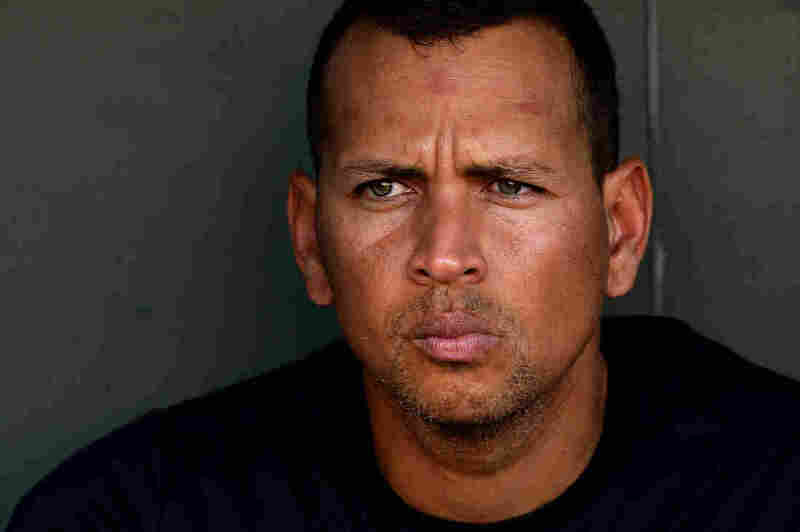 Alex Rodriguez Says 'Sorry' As He Returns From Seasonlong Suspension : The Two-Way The legendary slugger, suspended for drug use, denied for a long time that he had done anything wrong. Now, in a handwritten letter, he tells fans he takes "full responsibility" for his mistakes. Yankees third baseman Alex Rodriguez has apologized for his mistakes. Just as he prepares to return after a one-season suspension, Major League Baseball slugger Alex Rodriguez is saying he is sorry. "I take full responsibility for the mistakes that led to my suspension for the 2014 season," Rodriguez says in a handwritten letter. "I regret that my actions made the situation worse than it needed to be. To Major League Baseball, the Yankees, the Steinbrenner family, the Players Association and you, the fans, I can only say I'm sorry." If you remember, MLB accused Rodriguez of being involved in a drug use scheme involving a Miami clinic called Biogenesis. Rodriguez denied wrongdoing and sued Major League Baseball and the Players Association. The drama played out for months and ultimately ended in the longest suspension ever handed out for drug use. Rodriguez missed the entire 2014 season. As Yahoo sports has reported, Rodriguez is set to return this season, so he launched an apology tour. He said he was sorry first to MLB executives and then to Yankees executives. "I served the longest suspension in the history of the league for [performance-enhancing drug] use. The Commissioner has said the matter is over. The Players Association has said the same. The Yankees have said the next step is to play baseball. "I'm ready to put this chapter behind me and play some ball."